This story is so intriguing, riveting and unpredictable that I could not put it down until I finished reading the entire book. Well-researched and well-developed characters made it an engrossing and memorable account of a true story. The main character, Sue, had redeeming qualities as well as an independent self-serving attitude toward life. The history of this time period brought the story alive for me. It was amazing how the politics of the time was weaved through the story in such a easy and entertaining way. Bravo! Hope this book makes it to the big screen. skill to tell a compelling fast-paced story, make Flowers’ account of murder and mayhem read like a novel. 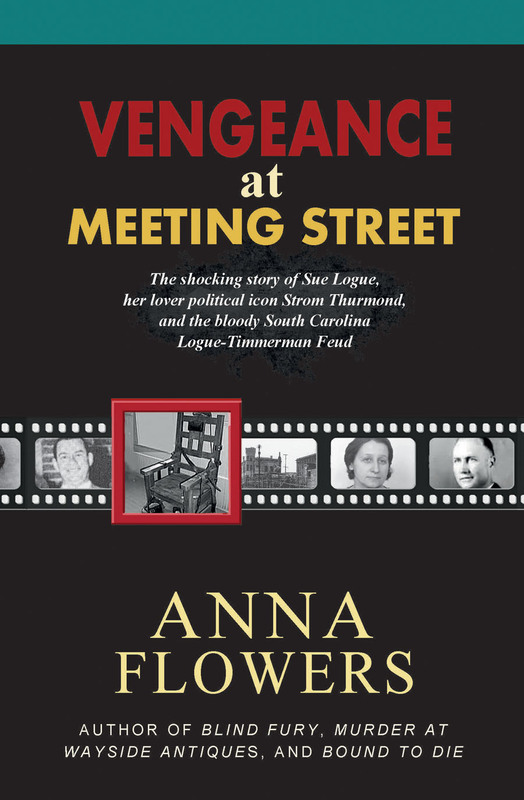 Author will be promoting her new true crime book, Vengeance at Meeting Street, at the Showcase For Authors, Artists and Musicians, held on Feb. 13 at Suntree Library in Melbourne from 1 to 3:30. It is sponsored by NLAPW/Cape Canaveral Chapter. The League of American Pen Women awarded Anna Flowers the Pen Woman of the Year for 2015. She was also the key note speaker at the November conference. Copyright ©2007 - 2015 Anna Flowers Books. All rights reserved.